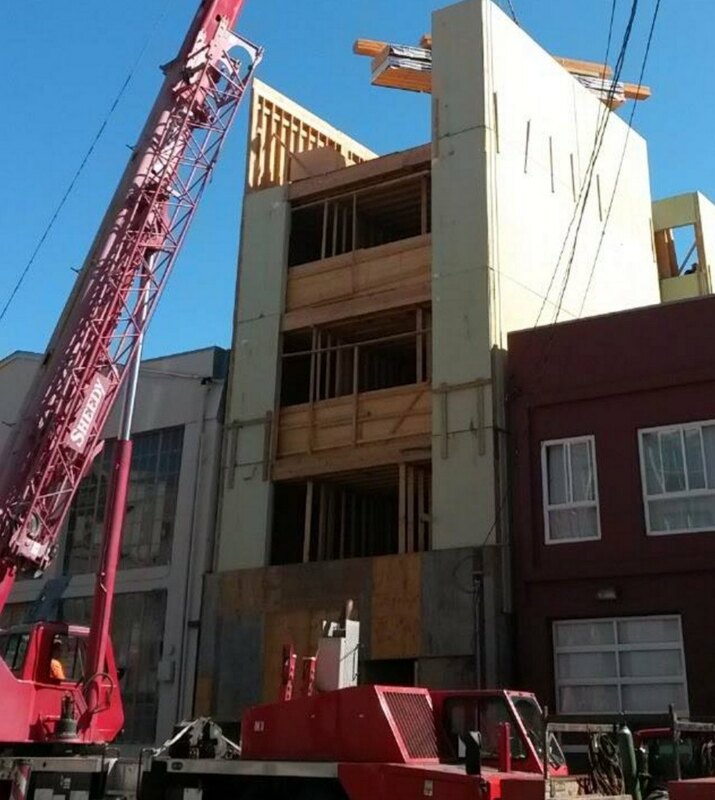 San Francisco's first ever Passive House condominium apartment complex is rising in the Mission Creek neighborhood, and amazingly, this über-efficient 6 story building doesn't just conserve energy through a tightly sealed building envelope, it also generates and stores so much energy it will function as its own 'Microgrid. The owner and developers Lloyd Klein and John Sarter of Off The Grid Design are excited to be building one of the first Passive House Certified Net Zero energy condominiums in California and one of the state's first Microgrids as well. The building will be considered a ‘microgrid’ because it is actually detached from the main city-wide San Francisco grid and instead powers itself and stores its own electricity in batteries; meaning that “if the electrical grid of the city goes down, the building will stay powered", says Sarter. 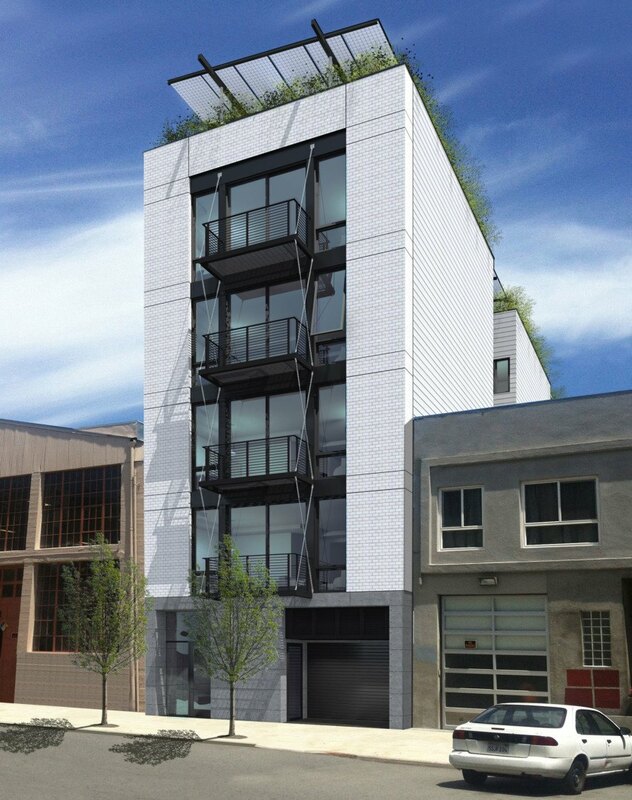 Followers of green building technology and resilient design are excited to see this groundbreaking project go up in the north east corner of San Francisco's Mission district, and hope it will inspire future innovations in building design. The Sol-Lux Alpha building, as the developers call it, is a luxury 4 unit condominium project at 685 Florida Street in the Potrero side of the newly dubbed “Mission creek” neighborhood of San Francisco (sort of the border between the north east Mission District and Potrero Hill). The building is currently being constructed, as you can see in these construction photos below, and is expected to be complete in spring 2016. 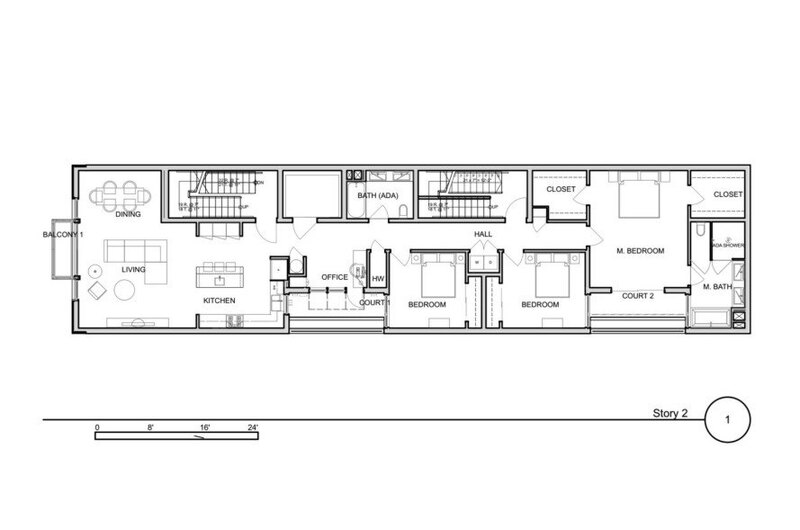 Each 1760 square foot unit is a three-bedroom, two-bathroom floor plan. Both Klein and Sarter are optimistic that the building will even get close to “Net Positive Energy” due to all the energy efficiency measures employed. One of the main requirements of the Passive House model is the building’s exterior envelope must maintain a thermally tight construction, preventing infiltration of outside air and loss of conditioned air. Riyad Ghannam of RG Architecture, the project architect, said one of the many challenges of building a passive house building was finding creative ways to minimize penetrations through the exterior walls in order to minimize thermal bridging. The front façade has an elegant cable-suspended, exposed tube steel balcony system to provide outdoor space at each unit in addition to help shade the west facing windows and minimize heat gain into the space. The balcony structural connections to the exterior wall were carefully designed to minimize penetrations through the envelope. 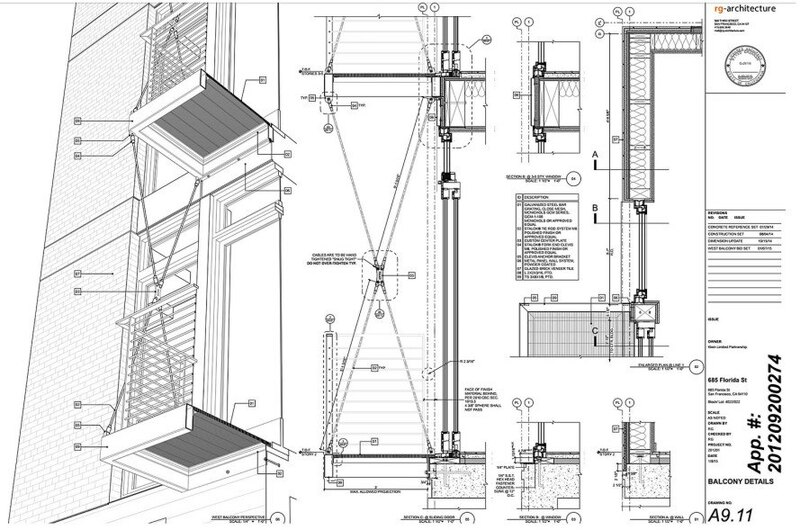 The 100% electric-only building is designed to be fossil fuel free. The building includes a large roof deck and garden covered by a semi-translucent BIPV, bi-facial PV panel trellis system. The bi-facial design gains added energy production through reflectance back to the panel from the roof in addition to the southern sky facing panels. The trellis system is also planned to serve as a rain catchment system and a very innovative ambient lighting system. Although in the passive house model, photovoltaics cannot be included in source energy offset calculations, the building as designed does meet the maximum total source energy without them. Inside the building, the energy recovery ventilation (ERV) provides continuous filtered fresh air and improved climate control and air quality for the residents while using less heating and cooling energy use. Passive House buildings use approximately 80% less energy for heating and cooling loads compared to buildings complying with current code requirements. Other energy saving features include a heat pump electric water heater and heat pump clothes dryer in each unit. The heat pump water heater will be located in a closet behind the refrigerator with a high and low vent between them. In this way, a convective heat/cold loop is created. The water heater will use the heat expelled from the refrigerator to heat the water and the cold air produced by the water heater used for refrigeration. There will also be “new to the USA” non-vented heat pump electric dryers specified for each unit. All the rest of each unit’s appliances will be top of the line Bosch “Benchmark”, ultra low energy models. Stay tuned for the building’s completion next year and see how well the passive house model performs in a 4 unit building. The Developers, Sol-Lux Alpha LLC and Off the Grid Design, and their Passive House Consultant, Graham Irwin of Essential Habitat, are showing how the common floor and wall areas between units help a building achieve the “highest bar efficiency” of Passive House Certification, and Net Positive Energy, in an very cost effective manner. This is wonderful, now what about water use? Does this building re-use water, recycle it? The owner and developers Lloyd Klein and John Sarter of Off The Grid Design are excited to be building one of the first Passive House Certified Net Zero energy condominiums in California and one of the state's first Microgrids as well. The building will be considered a ‘microgrid’ because it is actually detached from the main city-wide San Francisco grid and instead powers itself and stores its own electricity in batteries; meaning that “if the electrical grid of the city goes down, the building will stay powered", says Sarter. 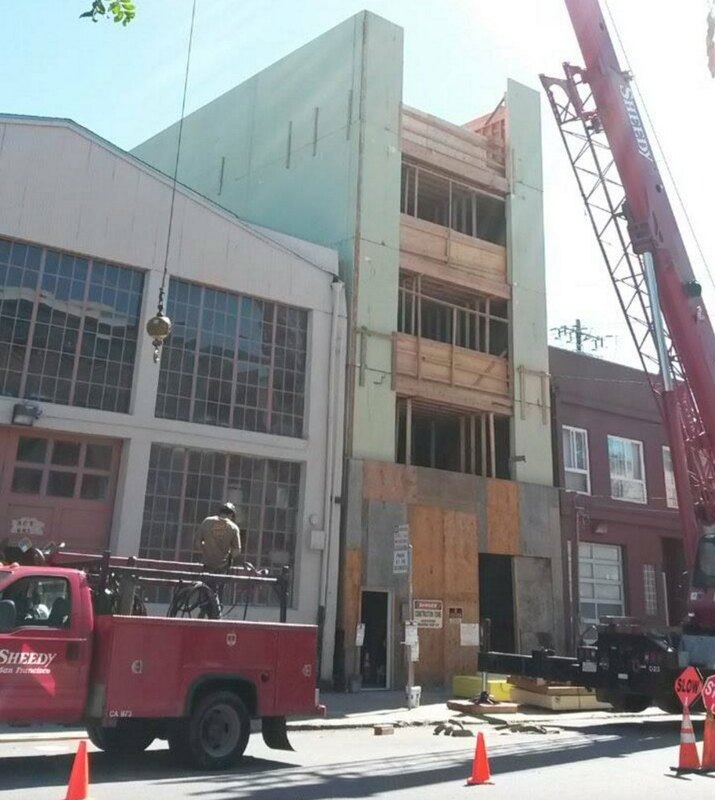 Followers of green building technology and resilient design are excited to see this groundbreaking project go up in the north east corner of San Francisco's Mission district, and hope it will inspire future innovations in building design. 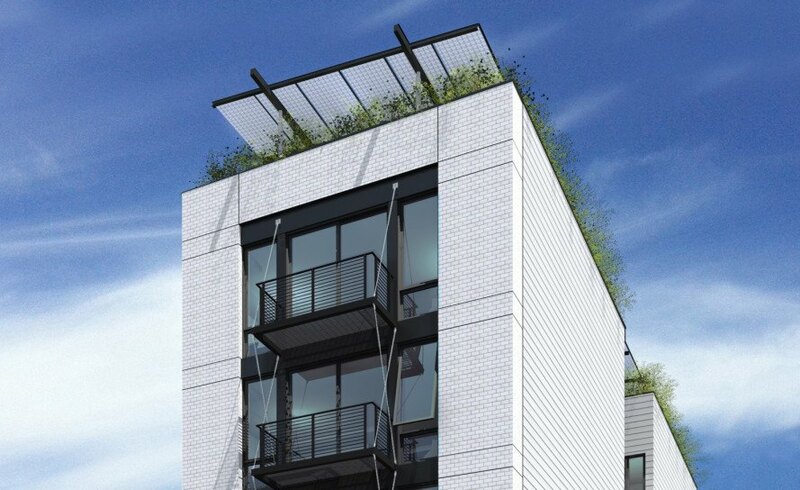 The Sol-Lux Alpha building, as the developers call it, is a luxury 4 unit condominium project at 685 Florida Street in the Potrero side of the newly dubbed “Mission creek” neighborhood of San Francisco (sort of the border between the north east Mission District and Potrero Hill). The building is currently being constructed, as you can see in these construction photos below, and is expected to be complete in spring 2016. Other energy saving features include a heat pump electric water heater and heat pump clothes dryer in each unit. One of the main requirements of the Passive House model is the building’s exterior envelope must maintain a thermally tight construction, preventing infiltration of outside air and loss of conditioned air. Riyad Ghannam of RG Architecture, the project architect, said one of the many challenges of building a passive house building was finding creative ways to minimize penetrations through the exterior walls in order to minimize thermal bridging. The 100% electric-only building is designed to be fossil fuel free. The building includes a large roof deck and garden covered by a semi-translucent BIPV, bi-facial PV panel trellis system. Inside the building, the energy recovery ventilation (ERV) provides continuous filtered fresh air and improved climate control and air quality for the residents while using less heating and cooling energy use. There will also be "new to the USA" non-vented heat pump electric dryers specified for each unit. All the rest of each unit’s appliances will be top of the line Bosch "Benchmark", ultra low energy models. Stay tuned for the building’s completion next year and see how well the passive house model performs in a 4 unit building. The Developers, Sol-Lux Alpha LLC and Off the Grid Design, and their Passive House Consultant, Graham Irwin of Essential Habitat, are showing how the common floor and wall areas between units help a building achieve the "highest bar efficiency" of Passive House Certification, and Net Positive Energy, in an very cost effective manner.